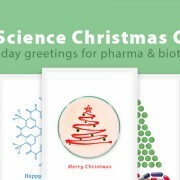 iPad sales presentations are perfect for life science event marketing, allowing immediate access to background materials and supporting media that are crucial for engaging with your potential customers. In this brief tutorial, I will introduce you to a simple yet powerful system for developing, storing, and maintaining your iPad presentations in the cloud. 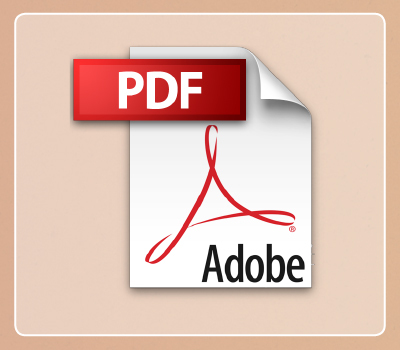 Adobe provides a free app and cloud storage account for customers using their software to develop iPad presentations (called “folios”). By utilizing this free service, a portable portfolio of sales presentations can be developed quickly and maintained efficiently. The iPad folio is a powerful tool for presenters to access relevant information while engaging with potential customers. A salesperson can go slide by slide through the entire presentation, or quickly dig in to a specific slide, video, or document to demonstrate a solution to the customer in a hurry. With your entire library of supporting materials available, your sales team will be equipped to answer any question with a touch of flare. Let’s get started by learning how it all works. 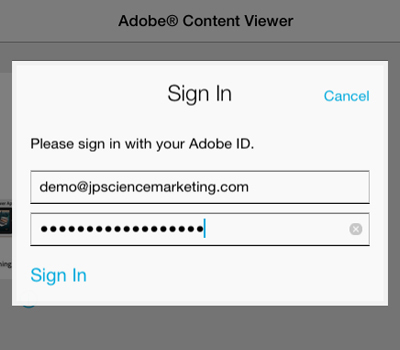 The Adobe Content Viewer (ACV) app is free to download and use. Search for the app in the App Store to download. Upon opening, tap on the icon in the top right corner and select “Sign In”. 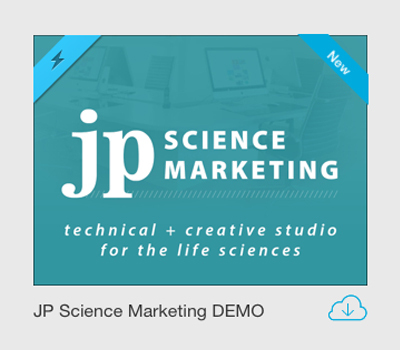 You may sign in with my username (demo@jpsciencemarketing.com) and password (jpsciencemarketing) for a free demo. 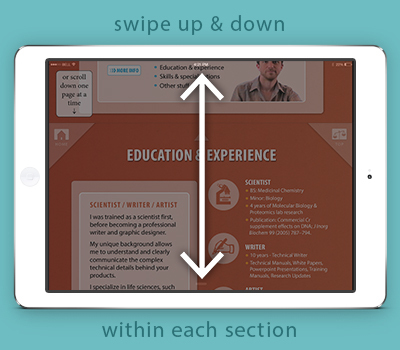 Once signed in, the app displays thumbnail images of your folios. 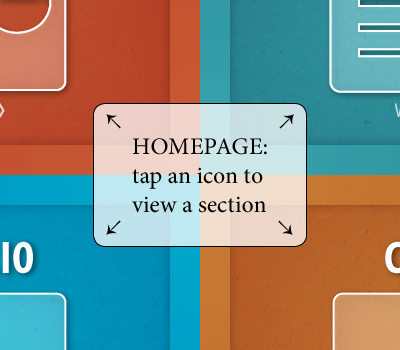 Tap on the thumbnail to download and open the folio. 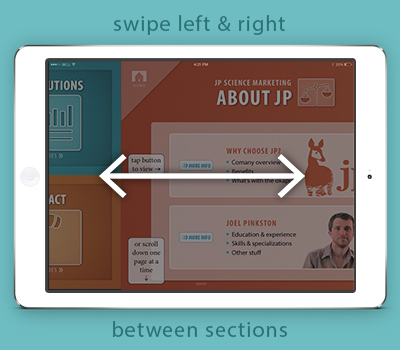 Folios can be designed in a horizontal (landscape) or vertical (portrait) format, or both (automatically switches on rotation of iPad). I like to design presentations that flow horizontally (swiping from left to right to move between sections) with detailed information flowing vertically within each section. To me, this seems most intuitive, however, other layouts are possible as well. Adding buttons makes navigating around the folio quick and easy. After listening to the customer’s needs, a salesperson can immediately dig down to a specific slide, video, or document to enhance their conversation. The iPad has unique capabilities that can be incorporated into your folio. 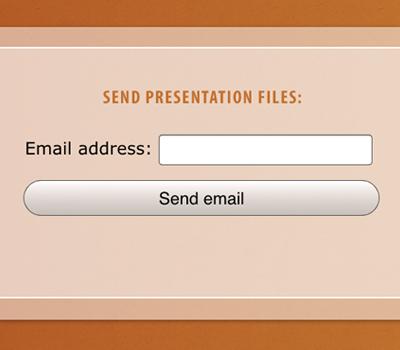 For example, an “Email” button can automatically open up the iPad’s Mail app with a pre-populated email ready to send. This is a great way to send links & downloads that the customer can access later, and it forms an instant contact to follow up with potential customers. Every brochure, white paper, tech manual, research article, and document associated with your products can be accessed from within the presentation. 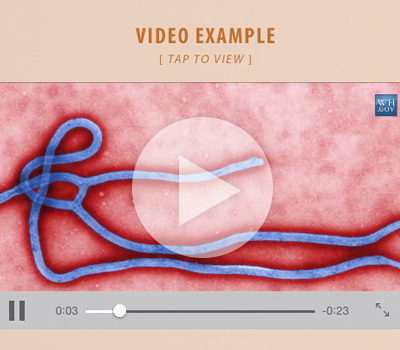 Videos can be imbedded into slides and expanded to play with full operating controls. 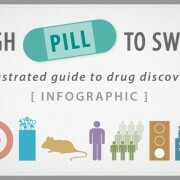 Charts, data, and illustrations can come alive with animated graphics. The possibilities here are endless. The free cloud storage account makes editing and updating your folios a breeze. 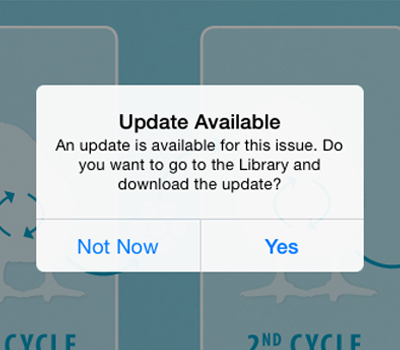 The ACV app alerts the user whenever an update is available for each folio. In this way, your folios can be managed remotely and you can ensure your sales force is always equipped with the most up-to-date information. Plan. The first thing to do is to brainstorm your game plan – decide which products would be best showcased on the iPad, gather information to be included, and then plan out a timeline for development. Connect. 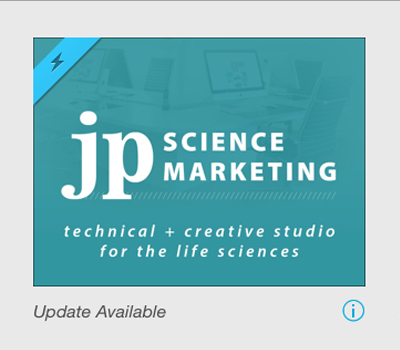 Next, find a designer with digital publishing experience. Contact potential designers and inform them of your goals for your folios. Be specific here – you must inform the designer of the specific features you would like to include in your folios. This way, you can get an accurate quote and keep your timeline on track. Create. 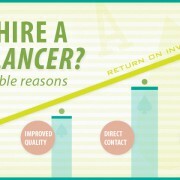 While finding your designer, you can develop your content. Many marketing managers find Powerpoint to be an easy way to organize content for their products into clean presentations. Perhaps a previously-developed slide deck explaining your product can serve as the starting point. But remember, an iPad has a wealth of features at your disposal, so don’t forget to think outside of the box. Edit. Finally, after you have worked with your designer to develop a template, continue to refine and edit your folios. 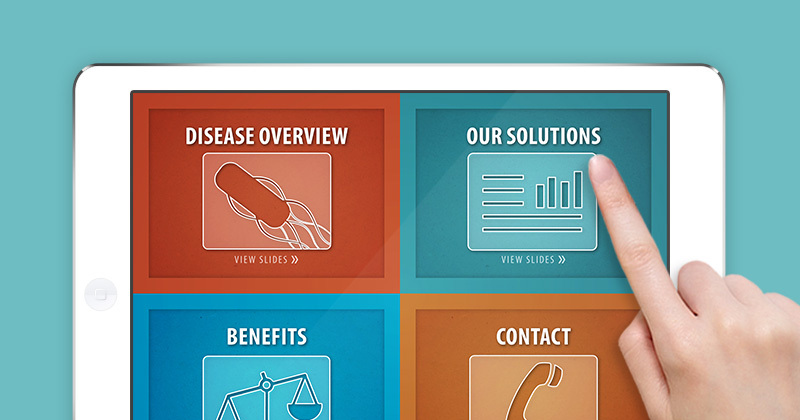 That’s the beauty of working in this system – these folios are flexible and easily editable. Every time a change is made, the updated folios are automatically pushed to your sale force’s iPads through the cloud for immediate download. 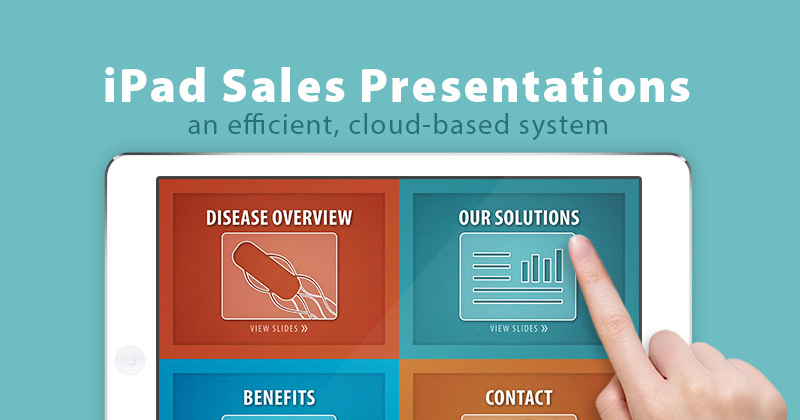 Need help with your iPad sales presentations? I can bring your content to life to help you engage with your target customers. Get in touch with me to learn how we can maximize your resources and achieve your marketing goals faster.